One of those days I suppose when you crack your head and literally nothing comes out. I suppose sometimes there's no point we push our brains so hard? Especially when brain is so tired of us pushing it to its edge until it will automatically stop functioning. Brain is too tired? Right. Precisely what my brain is going through right now. I am literally forcing it to think, but it just wouldn't. So, I have decided not to push it further. Who knows it may stop functioning permanently which by far is scary right? I know. So, I guess its best I just stick to the recipe of the day. This Indian Okra Curry. A vegetarian version (Indian Vegetable Curry, Cauliflower Curry, Carrot Poriyal & Mor Kuzhambu) and one which I think you in return don't have to crack your head. Basically, made with store bought curry powder instead of pounding or grinding or pulsing your own curry paste. Of course, if you insist on making the curry paste, you should? I basically wanted to keep it simple (Vegetarian Mutton Stir Fry & Coriander Rice) and also, once you have cooked this Indian Okra, Curry, don't be surprise that store bought curry powder actually did a good job. 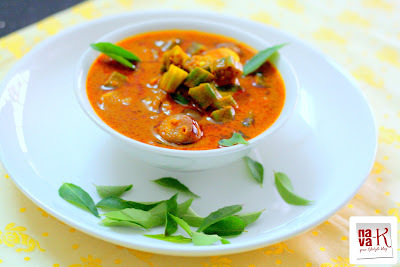 In fact, I couldn't be more pleased with the taste of this spicy, tangy (Turmeric Tomato Soup) and okra (Curried Okra & Kurkuri Bhindi), I am not sure how many of you are fond of it, but trust me, its like the perfect fit in this vegetarian curry (Creamy Coconut Lentil Curry, Mor Rasam & Drumstick Sambar). 15 okra/lady's fingers - cut into medium size rings. When oil is heated, fry shallots and garlic for a light brown outer layer. Add fenugreek seeds and fry till it splatters. Add curry paste and fry until oil splits/floats. 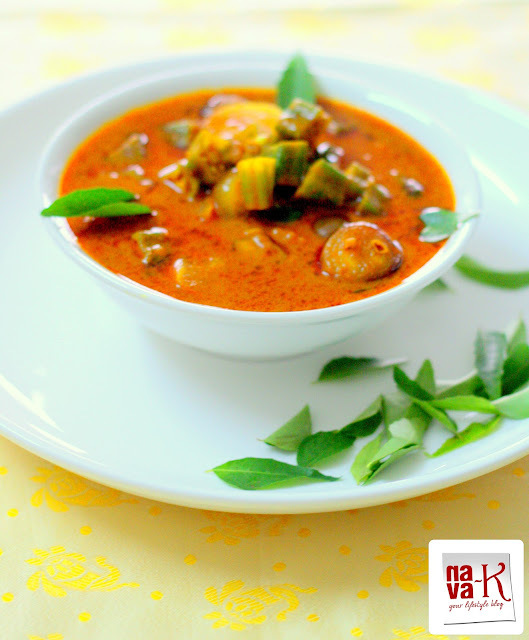 Pour 1/2 litre of water, tamarind juice and add okra and tomato. Stir all in and simmer to heat through. Stir, off the heat and combine in curry leaves. Okras are one of my fave vegies. Will happily eat up all the okras I can find in curries...extremely yummy yet strangely not many people appreciate it. I don't hv fish....maybe will try make Asam egg with the okra. same like you, I am nit keen eating steamed okra but hubi n parent-in-law likes. said its good for not sure diabetes or hyper tension. i love okra.. so delicious..
nava i love indian curry, my neigbour is a vegetarian indian who luv to give us her okra Dhal curry dishes.. luv it so much..
Okra is a very underrated vegetable but I have to say I love it. I have never thought of cooking okra in a curry but this one with tamarind paste looks totally yummy, perfect with rice. I like cooking okras with sambal & sometimes with just oyster sauce. Cooking okra assam style is great too. Yummy! Hi Nava! I just made this for lunch today because I really fancied something spicy. Had it with plain rice and a little sardines on the side. Your curry is very yummy! Thanks! the colour of the curry looks good! I love lady fingers! Mum makes it into a curry - sweet and sourish - vegetable soup so Good! And this looks pretty amazing!! Love them in curry!! Looks so flavourful! !